More Toy Story 4 sets revealed! Most of the sets based on Disney and Pixar's upcoming film Toy Story 4 were already revealed at New York Toy Fair in February, but there were still a couple known that we hadn't seen... until now. 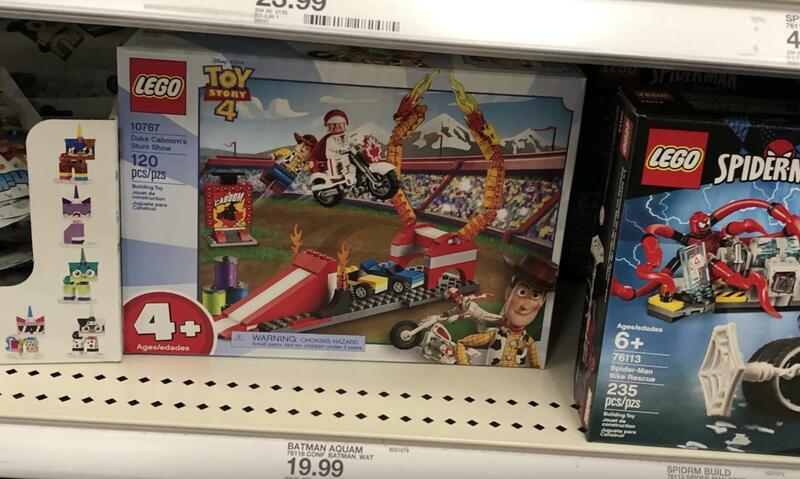 just2good has discovered 10767 Duke Caboom's Stunt Show and 10768 Buzz and Bo Peep's Playground Adventure at a Target store in Florida. They are priced at $19.99 for 120 pieces and $24.99 for 139 pieces, respectively. These, as well as the rest of the line, should be fully available in May. What do you think of these two sets? Will you be purchasing them? Leave your thoughts in the comments below! Thanks to just2good for the news. You can check out his reviews on YouTube. Interesting. That spoon figure will have MULTIPLE uses. NOT. OH MY GOODNESS WHAT A USLESS MOLD. Except of course for the character but no reusable qualities whatsoever. Guess this clears up the debate about whether Duke Caboom is spelled with a "C" or a "K". Overall, I'm disappointed in these sets compared to the Toy Story 3 sets, which I missed out on. I was really hoping it would be a second chance to at least get the figures with the molded heads since they already had the molds, even though it wasn't going to be a second chance at the Pizza Planet truck I really want. To me, these Woody, Buzz, and Jessie figures look like ordinary random figs wearing costumes. I've got to say I wish these sets were not 4+ sets as they could have been so good, a missed opportunity. Though I want to get all the figures although having watched Just2goods videos he mentions buzzes head is printed poorly on both versions he got so that disappoints me. Though I love the Woody an Bo Peep figures they look good despite no having much wanted moulded heads. The best sets to me is the small Woody and army men set and Duke Caboom's set. Also the prices are fair enough for these sets as they range from £9 - £45 ($10 - $50). The new 1x8 slope is quite amazing piece. The spoon mold could be used for a baby groot dancing perhaps? Some foliage? A lot of these figs look like huge downgrades from the old Toy Story sets, especially Buzz and Woody. I like RC and the carnival set with the shooting gallery (great companions to Disney Castle!) but the rest of it’s a bit too juniorised for me. They’re certainly not bad sets, but the older I get the easier it is to set aside certain sets altogether. I’ll buy enough for the characters I care about. Like RC, Woody, Mister Bill Fpork, and Rex. Anything else out in May? I'm increasingly curious as to why Florida, Georgia, and sometimes Texas so commonly get products on retail shelves weeks earlier than anywhere else in the world, sometimes so far in advance that the products haven't even been announced by LEGO itself. Are they designated test markets or are distributors and/or retailers just rogues in those specific regions? As for the sets I like the RC one. I've never been into the franchise though, so I'm not a good person to judge the line. As simple 4+ toys they seem well enough designed for basic play independent of specific events of the movie(s). Off-Topic here: Did you know that they are making Lego The Angry Birds Movie 2 sets? south florida resident here, no shelf stock in my local stores this afternoon. I was in a bit of a hurry so I didn't check with customer service. hopefully tomorrow I will get lucky. Be riding the motorcycle, be like "Ohhh Canadaaaaa"
@kiddiecraft, just looked it up - definitely either fake or a knockoff. I can definitely pass on them. I’m still a little angry they sold out to make another one. The third ended on a good note. Do people really care about Toy Story still? The first came out when I was 10, so I guess I’m speaking from s different viewpoint. The figures are definitely subpar from the old way. @your prez. You could say the same thing about the baby groot mold but it doesn’t mean I don’t love it and want more. I will certainly get them, as they are reasonably priced, although I still hope to get them at 20% off. I'm glad they are 4+ as that ensures no stickers, only printed pieces. I was not a fan of how Toy Story 3 ended, so rebooting it doesn't bother me. If the reviews are positive, I'll probably see it. I'll get most, if not all, of the TS4 sets, though. Brutal, they cut Woody’s legs in half. @theJANG I believe it depends on the Target itself, for all three of the Florida targets closest to me are extremely strict when it comes to early product releases and oftentimes don't even have the newest products that were officially released. When singing 'Everything is not awesome' in TLM2 the characters were talking about these horrible thrown together mess of sets. OMG they wrote it caboom bc of Canada right? To me, these might have been a bit better had they not been Juniors sets. I thought LEGO learned from their mistake with the big, premade pieces in Jack Stone? But, I see some improvements. One, Woody and Jessie are standard figs, not the weird tall figures reminiscent of Jack Stone (again). Same with Buzz's head. At least the roller coaster is a useful set in a carnival build as a kiddie ride (and it does resemble those I see at state fairs and the like), and I really like the stunt show. One thing I wish it had was Army Men and Aliens army builder-type sets--sort of like Benny's Space Squad. I know we had them in the last Toy Story line; but not this one. Duke Kaboom reminds me of a certain stunt man. Edit: I love those soldier nano figures as well as that spoon guy. And not using the old Woody and Buzz head moulds? What?